as you need to to figure out where it is. you right into Mena, AR. 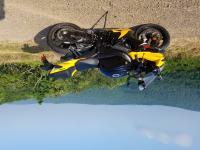 Another contributer added the following:"Scenery like Blue Ridge Parkway in N.C.. Road on top of Washita Mountains." Photo contributed by visitor in Jun 09 - "Most of our pictures were taken from the back of our Harley I ride a lot with the camera around my neck so I don't miss a thing! This pic we were rounding a curve and could see the road we would be traveling on soon right next to us ... WOW it was awesome! " As mentioned above, the road is filled with lots of curves, switchbacks and steep grades. The speed limit is SLOW which of course allows you to enjoy the scenery. Since the road generally only supports scenic traffic, the road conditions are less than perfect. Since you will be traveling well under the speed limit, you will probably not even notice an occasional pothole. Photo contributed by visitor in Jun 09 - "You could see the road on every mountain and knowing we would travel those roads soon was thrilling to us!" Access can be at Talihina, OK on the west end or Mena, AR on the east end. Both of these towns offer lodging and restaurants. We usually travel from west to east, ending in Mena. The motels in Mena are accustomed to motorcycle riders and even provide towels for wiping off the dew in the morning. Along the way you will find several vistas and picnic grounds at Old Military Road and Horsethief Springs. You may also want to stop by the Kerr Nature Center which has trails and exhibits that focus on the region's native flora and fauna. The highlight stop along the way is the Queen Wilhelmina State Park and Lodge sitting high atop Rich Mountain. The park includes a lodge with 38 rooms, restaurant, gift shop, and campsites. The park and lodge are located near the east end of the drive just a few miles from Mena.Talihima State Park is also in the area for you to enjoy. Another contributer added the following:"Camp grounds at Queen Willimina. Childrens' small train ride. Nice Lodge, several lookout spots." Photo contributed by visitor in Jun 09 - "Our first vista stop at Talimena we seen this passion flower what a wonderful welcome to the ridge!" Photo contributed by visitor in Jun 09 - "Kiamichi Valley Vista. This was my first trip across the Talimena Scenic Byway. It most definitely will not be my last. Very engaging ride! I'm looking forward to a fall ride." on October 21, 2012 8 out of 8 members found this review useful. The road was beautiful as always and is a great ride. It must be noted the the road condition on the Oklahoma side is poor. It has been repaved in spots with gravel and oil which creates a somewhat dangerous ride. Someone didn't use good judgement as the road has a large percentage of motorcycle traffic and the loose gravel is dangerous. Please use caution. on April 1, 2015 4 out of 4 members found this review useful. The Talimena Scenic Byway is a wonderful ride heading East out of Talihina, OK on Hwy 1 transitioning into SH88 to Mena, AR. The 54 miles of good roads, excellent scenery and a combination of twisties and straightaways with a higher percentage of curves makes for an excellent ride through the Quachita National Forest! At the time of our ride, 3/30/15, the QUEEN WILHELMINA Hotel was under remodel. WARNING: Please take note and extra caution when approaching the Eagleton Vista corner. This is about 5.4 miles West of Mena, AR. This corner is a triple threat do to its decreasing radius, negative camber and transitioning from slight uphill to downhill grade as you enter the turn. on August 22, 2014 3 out of 4 members found this review useful. I've ridden this route several times and it is still amazing! Nice views and a great road. Always turn north at Mena and ride Hwy 23 back north! on December 14, 2011 3 out of 3 members found this review useful. Rode the Skyway mid-week in early June of 2011.No traffic worries and plenty of opportunities to air out the Trophy. Elevation changes, beautiful views and twisties to delight any rider. What's not to like! Booked two nights at the Queen Wilhelmina Lodge -very reasonable prices and the food was terrific. We were advised by the Lodge desk to be aware of Black Bears recently seen nearby! Recommend an eatin" stop at Pam's Hateful Hussy Cafe in Talimina OK. Great comfort food, atmosphere and pie to die for. Forget counting the calories. Mena AR, on the other end of the Skyway, is a good rider destination. A walking tour of the downtown area will not disappoint. Popular spot for motorcyclists from around the area. Multiple eateries to choose from, too. Fall colors attract way too many cars and motorcycles. Although the scenery is outstanding, the constant stop n' go quickly gets annoying. Distracted cage drivers on your 'six' take all the pleasure from the ride. on November 7, 2010 3 out of 4 members found this review useful. Best time: Late October. Not a "10" due only to other traffic. Queen Wilhelmena Lodge good coffee stop. Will be lots of other bikes in the parking lot. Another road parallels the pkwy to the south; thought it might make a good loop ride. Nope, ugly road; stick to the pkwy. Another good ride is to Mt. Magazine, further north in Ark. on September 23, 2014 2 out of 2 members found this review useful. Beautiful ride. We camped at the Queen Wilhemina State Park the night before and then rode it in the rain. The road is of such good quality that the rain didn't make much of a difference. There are some truly beautiful views at points along this route. on July 21, 2014 2 out of 3 members found this review useful. This is a great ride. We started out in Oklahoma and headed to Mena. There are many places to pull off and get some good pictures. One of the first is "Panorama Vista" which offers almost a full 360 degree view of the valleys. Lenox and Grand View are a couple of the other great pull-offs. Most of the others were overgrown with trees/brush, making it difficult to see anything. The road quality is good, the only exception being a short section (3-4 miles) of tar and gravel surface which gets a bit rough in places. No matter which way you're going, stop in at Skyline Grill in Mena, AR for some wonderful food. We stopped for lunch and had a great meal; some of the best food I've had. They serve breakfast all day, but were only open until 2pm on the Sunday we stopped in. One note: Queen Wilhelmina Lodge is closed. There is nothing on the website, but it has been closed for a couple of years due to renovations. The park is still open, but there is NO access to the lodge area as of 7/21/2014. on June 5, 2014 2 out of 2 members found this review useful. Have rode this route several times and enjoy it each and everytime. one of my favorite routes in Oklahoma. I just wish there were more like it. The road is patroled so be on the lookout. on February 14, 2013 2 out of 2 members found this review useful. on October 1, 2010 2 out of 3 members found this review useful. I've ridden T. Ridge probably 30 times as I live in Okla. and am a CMA member ( hq. in mena ). I never get tired of the ride or the views. Be sure to go in late Oct for the changing of the colors, they are beautiful. These aren't the Rockies or the Smokies but for living in Okla it's like being there. Ride safe and watch out for the pine needles on the curves they have put riders down. In all the years and trips I have NEVER seen a four leg of any kind on the road or near it to cause dangerous riding. Mena has tons of motels but in the fall it can be difficult finding a room due to the popularity of the ride. God Bless and Safe riding. on June 28, 2010 2 out of 2 members found this review useful. I rode from West to East in the early morning in June. Beautiful views and lots of animals on the road. I even saw a Roadrunner (beep, beep). My only negative about the ride was the dried grass on road due to recent mowing operations. Large clumps of weeds and grass in the curves kept speeds very low. on July 12, 2009 2 out of 2 members found this review useful. Just got back from this ride, had the wife and some friends along, Hotter than an old wood burning stove, but still a great ride,beautiful scenery, some nice curves and long strait stretches,only 1 cop along the way, some of the vista's reminded me of the Cherahola Skyway since it was a lil hazy in the distance,highly reccommend it for a ride,,,,Hot or Cold,but would avoid it if there is any chance of rain d/t i hate sharp curves with water runnin off of the glasses. on January 9, 2017 1 out of 1 members found this review useful. Me and my wife love it ! We got to see a Mama Bear and her two Cubs. on April 2, 2014 1 out of 2 members found this review useful. Wanted to get away for the weekend and looked up rides near me. This one looked nice so we set out from Dallas area mid-day. Took about 3.5 hours to get to the start of the By-Way. The views were awesome and the turns and dips throughout the ride were great. The only negative was about 20% of the road on the Oklahoma side had been re-topped with rock over tar. This would not have been an issue except the gravel on top was still somewhat loose. I know that from all the tings of rocks bouncing off the bottom of the bike. I did take it slower in the turns and did not have any big issues, but it did worry me some. Once the warmer weather sets in this summer, I'm sure the gravel will imbed itself in the undercoating of tar. We did plan to make it to the ridge early in the afternoon but due to traffic, arrived late afternoon. It was a bit chilly even with hoodies and leather jackets but the ride was worth it. The wife and I did spot a wild turkey crossing the road and saw a whitetail doe on the edge of the woods. We were a bit sad not to see any black bear. Many others have stated seeing them but may have been too early in the year. Overall it was well worth the trip. After hearing many of the locals talk about all the fall colors, we will surely make the ride once again in say October. on July 29, 2013 1 out of 1 members found this review useful. on March 28, 2012 1 out of 3 members found this review useful. Road for 1 hr 10 min before seeing another vehicle! Even with a haze it was still breath taking. Will go again just not in March. on January 3, 2012 1 out of 1 members found this review useful. This was such and awesome ride. We stayed in Hot Springs, so the ride to the start was equally good, but the actual Skyway is awesome, big swoopers, really get some wind in your face!! You see roads going up and over the next ridge from the top of the previous ridge, very cool experience!! on April 22, 2011 1 out of 1 members found this review useful. I've ridden this route several times and it's always as great as the first time. We are making plans to ride from Mt Magizine into OK and pick up the Talimina Trail (west to east) to the lodge @ QWSP in May 2011---just around the corner. Be safe. watch the 'other guy' at all times! on July 28, 2010 1 out of 1 members found this review useful. The ride was nice very scenic, also saw a Black Bear, at area where a sign said Castle Rock or view. Road was good enough. on June 14, 2010 1 out of 1 members found this review useful. on December 8, 2009 1 out of 1 members found this review useful. This is a fantastic ride and definitely recommend it to anyone. The food at Queen Willhemena Lodge leaves a lot to be desired so stop at the Chopping Block or Fish Net in Mena. Also if you are feeling energetic climb the Rich Mountain lookout tower for a fantastic view. on March 15, 2019 0 out of 0 members found this review useful. Ran this for the first time yesterday. What a beautiful ride! Road is in good condition. Make sure to plan for time to stop at the vistas for pics and to enjoy the scenery! on March 2, 2019 0 out of 0 members found this review useful. I have ridden this road twice once in the fall of 2017 to enjoy the beautiful fall color change and again in May of 2018.. Great little road with beautiful views.. The road is a little rough in spots but nothing that would make it not worthwhile.. Plan on riding again when the weather breaks..
After many years riding Arkansas roads I rate this route as 3. But for a great lunch try the buffet at the Lime Tree Motel, you will not be disappointed. The best riding in Arkansas is north of the Arkansas River. on October 14, 2017 0 out of 0 members found this review useful. l"ll see in NW AR? on September 25, 2016 0 out of 0 members found this review useful. This road is absolutely beautiful. Like the other reviews state, the Oklahoma side isn't the best, but as this road has mostly meandering corners, it's not bad. There are NO roadside amenities. There ARE plenty of beautiful places to pull out and enjoy the view. This is easily one of the better rides in Oklahoma. on September 24, 2011 0 out of 0 members found this review useful. on October 8, 2010 0 out of 1 members found this review useful. I HAVE RIDDEN THIS ROAD SEVERAL TIMES OVER THE LAST 7 YEARS. IT IS ALWAYS A PLEASURE TO RIDE AND THE VIEW NEVER GETS OLD. THIS IS A RIDE YOU HAVE TO SHARE WITH FRIENDS. ALSO, THE QUEEN WILHELMINA LODGE IS A VERY NICE PLACE TO SPEND A NIGHT AND THE FOOD IS GOOD TOO. THE LODGE HAS AN EXCELLENT VIEW OF THE SURROUNDING TERRAIN. SAFE BIKING EVERYONE !! on October 3, 2010 0 out of 1 members found this review useful. on July 25, 2010 0 out of 3 members found this review useful. Take raingear if there's a chance of rain. Rode it in May on a 30% chance. I knew we were in trouble when the sky turned black and the clouds were lower than the mountaintop. The temperature dropped 20 degrees and the heavens opened up. Absolutely NO PLACE to get under and out of the weather. We made it to the lodge and with hypothermia setting in stumbled in looking like drowned alley cats. All booked up no rooms available. Since nightfall was coming quickly we headed for my buddies house in Fort Smith in that torrential downpour. We rode in that rain at night with no windscreen or helmets all the way. The most dangerous ride of my life. on June 19, 2010 0 out of 0 members found this review useful. We just rode this Memorial weekend 2010. Three of us rode to Poteau, OK from Wichita/Winfield, KS and one rode up from Dallas. Poteau was kind of a half way point for us. Best Western in Poteau was wonderful. Wister lake area proved to be a nice ride the evening we all arrived. Then one day for Talimena drive...and was it ever amazing. We're already planning an October visit to enjoy the fall colors. MUST SEE !!! on May 1, 2010 0 out of 1 members found this review useful. I went in late fall and the trees were 1000 colors. It is a beautiful ride. on April 5, 2010 0 out of 1 members found this review useful. Great road! Only three hours from where we live in Texas and we try to make it at least once every month or so. The Lodge has the world's best coffee and the food is not bad either. If you're into camping, it's a wonderful spot and you may even see a bear or two. The bathrooms are clean and the water is hot. on May 6, 2009 0 out of 1 members found this review useful. on February 16, 2008 0 out of 0 members found this review useful. made the trip several times, best time to go late nov.